An action RPG title for PlayStation 4. It focuses on fighting against hordes of huge monsters using a wide arsenal of weapons and attacks. God Eater 3 is an action-RPG game set in the post-apocalyptic world. It is the work of Japanese Shift studio, which developed the entire series and games like Freedom Wars and Ape Academy 2. The story of God Eater 3 takes place many years after the events of the second entry in the series and takes us again to the distant future, in which humanity is on the verge of extinction due to the appearance of beasts known as Aragami. Regular armies proved to be ineffective against them, thus the task of defending humanity was given to the titular God Eaters – a specialized warriors wielding powerful weapons known as God Arc that are the only way to hurt monsters. Players act as one of such fighters, but when the game starts, something bad is going on with God Eaters, with many of them coming closer and closer to the dark side. God Eater 3 expands on the ideas featured in the previous games, being an action-RPG title with a camera placed behind our hero. During the campaign, our main activities are missions that usually come down to killing all Aragami in a certain location, and some of them feature additional objectives or things to hinder our progress, e.g. time limit. As such, gameplay revolves around combat, which is based on complex and arcade battle system known from previous entries in the franchise. Players can use a huge variety of weaponry and types of attacks, and battles themselves are fast-paced. There are some novelties added to this scheme, like the ability to use two weapons at once, each held in one hand. Additionally, maps are much bigger and more varied, while enemies have more diversified attacks. This forces players to change tactics more often than in previous God Eater titles. 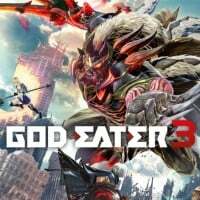 God Eater 3 offers a huge campaign, which can be completed solo or in online cooperation mode. The game was designed in a way that allows other players to join or leave our session at any moment, meaning we can get help only during the most difficult missions and play the rest of the game by ourselves. Third God Eater is the first game of the series developed mainly for stationary platform instead of handheld devices. This resulted in higher quality visuals and bigger maps filled with more enemies.